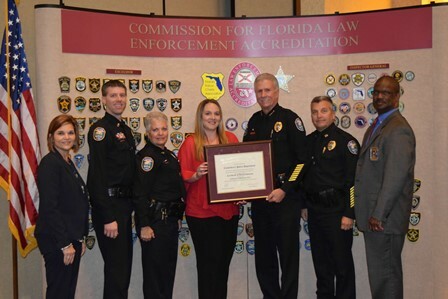 In June 2001, the Casselberry Police Department became accredited through the Commission for Florida Law Enforcement Accreditation, Inc. To accomplish this task, the agency showed compliance with hundreds of standards established by the Commission. These standards ensure agencies provide quality service to the community, as well as reduce liability for the agency and its members. In June 2004, the Department successfully completed our first reaccreditation. In June 2007, we rose to the challenge and completed our second reaccreditation. In February 2011, the Casselberry Police Department was reviewed by the Commission to determine compliance with the state standards and they unanimously awarded the agency reaccredited status. In February 2017, the Department went through our fifth reaccreditation. During the on-site review, assessors from around the State inspected our policies and practices, interviewed various personnel and conducted a thorough review of files. The Department met over 250 standard requirements and was awarded reaccreditation, which will remain in effect for three years. Being an accredited agency holds the Casselberry Police Department to a high quality of standards and expectations. It is the Police Department's commitment to maintain this level of performance and continue to deliver the quality of service Casselberry citizens have come to expect.